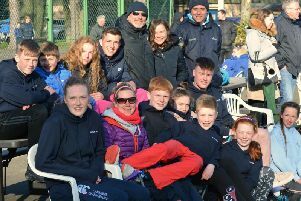 Saturday saw Duns ASC hosting the Border Relay Championships at Eyemouth Leisure Centre with teams from Duns, Eyemouth, Gala, Kelso and Peebles competing over three age groups. Eyemouth & District ASC had another successful weekend adding more silverware to the Minnows trophy and Ian Learmonth relay trophy won at their own Mighty Minnow’s Meet. Eyemouth’s junior team (Archie Stevenson, Ben Gillie, Ben Wilson, Flynn Beveridge, Amelia Stevenson, Finty Gilmour, Libby Shaw and Poppy Shaw) had a fierce battle with Peebles (current Border League Champions at this age group) but this time dominance in the medley relays saw Eyemouth came out on top. Success continued for Eyemouth’s intermediate team (Ashley Griffiths, Lucas Birkett, Nathan McCraw, Stuart Weeks, Chloe McCraw, Keira Pemble, Mairi Pemble and Rebecca Cash) in an incredibly close contest Eyemouth came out on top with three clubs tying for second place. Duns ASC were able to comfortably take home the senior trophy, but Eyemouth took the overall trophy home.